This dress has been a long time coming. 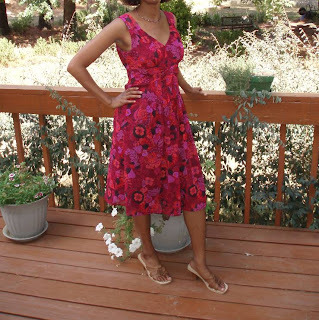 I completed the Simplicity 3867 dress about a month ago or so, and I just got around to taking some pictures of it. For some reason, I was intimidated by this pattern even though I had seen several reviews on Pattern Review that were positive. It really is a very flattering dress, and I think it would look good on several body types. I debuted this little number at my mother’s church’s homecoming service. The jacket (pictured below) came in handy for the chilly A/C. I bought this fabric on sale at Hancock Fabrics: $2.00/yd. So, of course, I bought four yards of it. I have just enough left over to make the top of this same pattern. It’s supposed to be my wearable muslin, because I originally wanted to make this dress in silk. I didn’t add a lining, which I really should have. I just hiked up a slip underneath and called it a day. You can read my full review on Pattern Review. 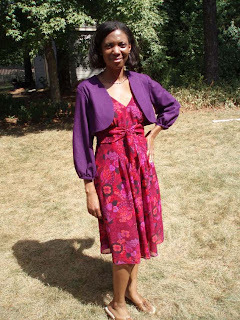 Hi, just read your review of this pattern in PR…love the fabric you used, and the jacket looks fantastic. It really pulls it all together. Did you make the bag, too? I just bought this pattern, and can’t wait to get started. I think it is the perfect dress – make it in silk or some other fancy stuff for weddings, and in cotton for days at the beach! You look gorgeous! Well done. I really liked working with the silk fabric. It was easy to work with, and it turned out really striking. That is too cute! !That jacket brings that purple right out! What a wonderful combination! Even though I have seen some reviews of this pattern before, it just now caught my eye because of your review. Great!!! I love both the jacket and dress on you! Its great to see a woman who is not afraid of color! 🙂 And nice to see you posting again! Thank you for visiting my blog and for your compliments on my dress! I hope this won’t be the last time you stop by. 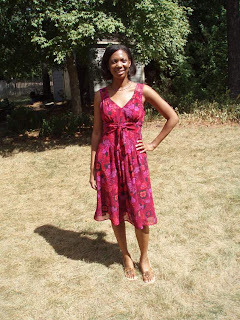 Really lovely dress, read your review at PR. Like the jacket as well. This dress looks fantastic on you! Definitely make another.